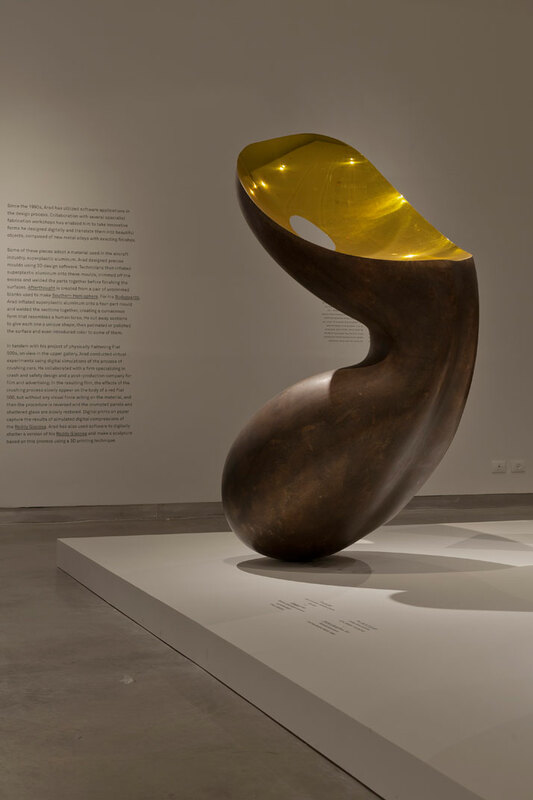 It’s a well known fact that one of the greatest talents to emerge out of Israel is renowned designer, artist & architect Ron Arad awarded (in 2011) with the London Design Medal for his longstanding contribution to design. We have followed his work for decades and it has never failed to amaze us. 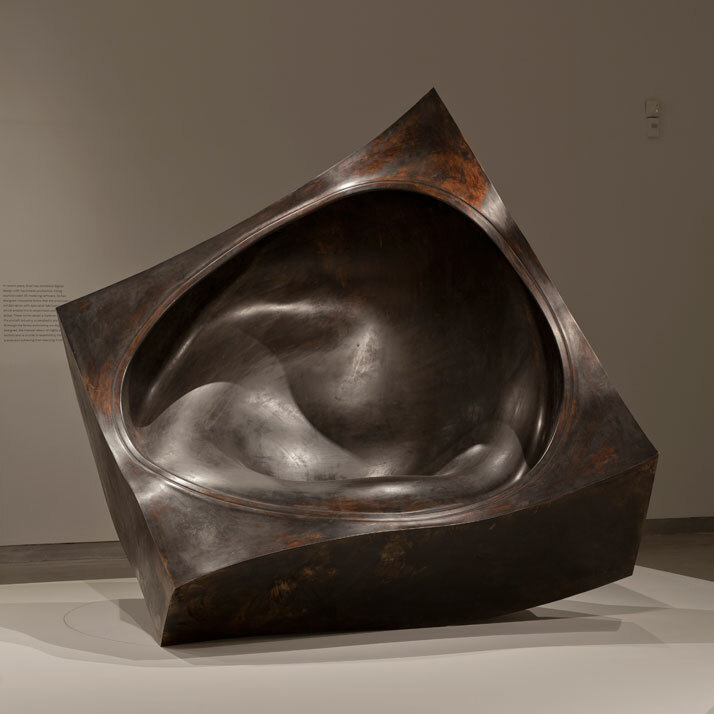 With this in mind, the Design Museum Holon, Israel, designed by Ron Arad which was completed in 2010, opened its doors on Wednesday the 19th of June with his newest exhibition which constitutes a tribute to this talented master. 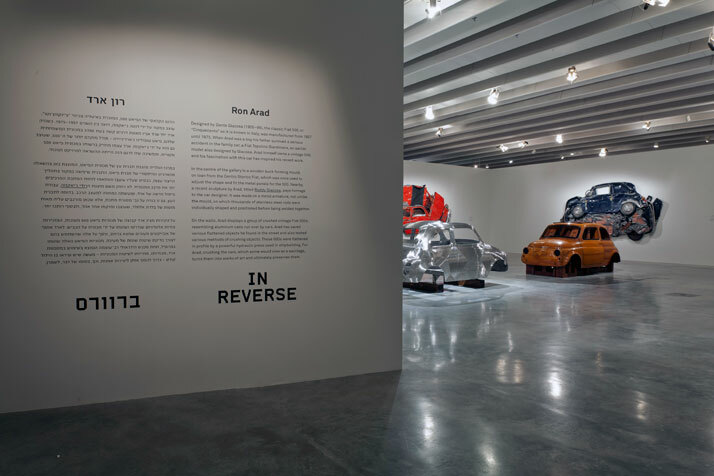 The fact that his new exhibit IN REVERSE, together with a number of his signature pieces, is housed in the great building that he himself created, is truly magnificent and signifies a full circle that only few individuals have ever experienced. 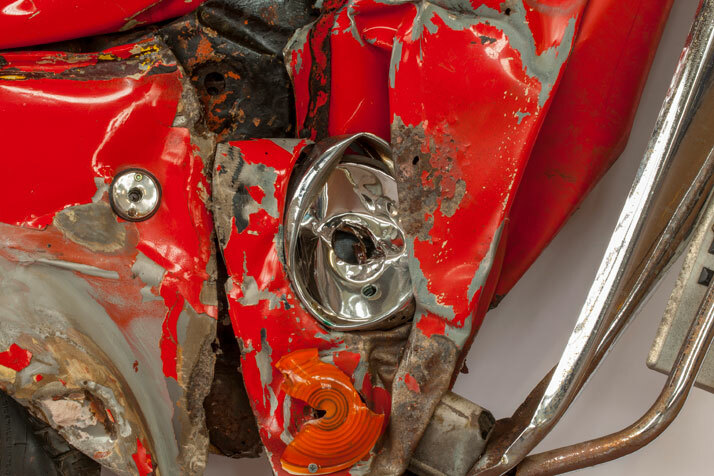 In Reverse, Roddy Giacosa (detail), 2013. Photo by Roddy Giacosa, Courtesy of Ron Arad Associates. 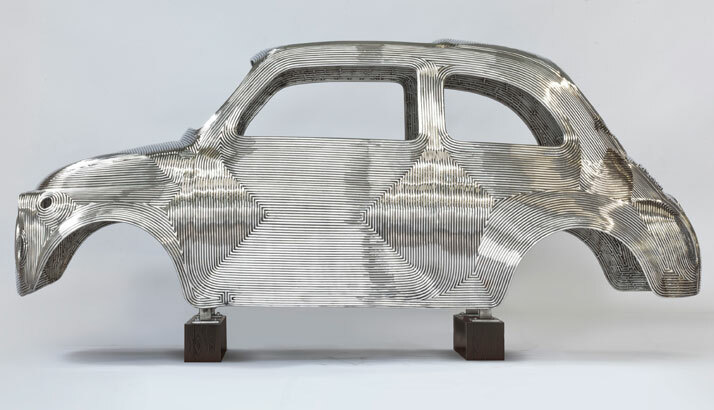 In Reverse focuses on Arad’s love of metal throughout the years where classic creations from the 1980’s illustrate his experimentation with this medium. 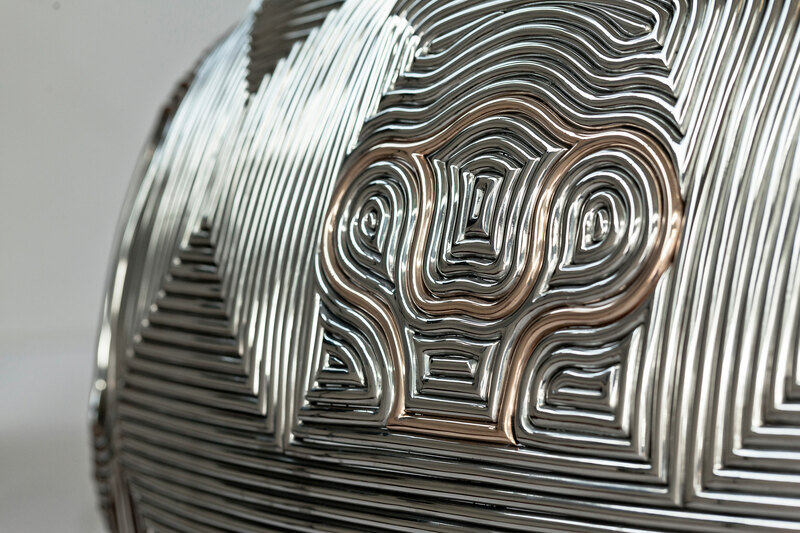 Afterthought (2007), one of our favorite pieces on display is mesmerizing through the sheer movement of it all. 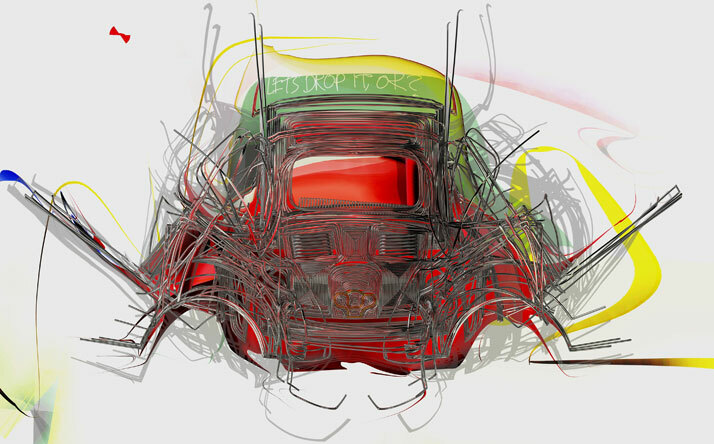 In addition to his all time classics, Arad’s new source of inspiration for this exhibition is his exploration through physical experiments and digital stimulations in the way in which automobile bodies behave, specifically the Fiat 500, under pressure. In Reverse, Pressed Flower White (detail), 2013. 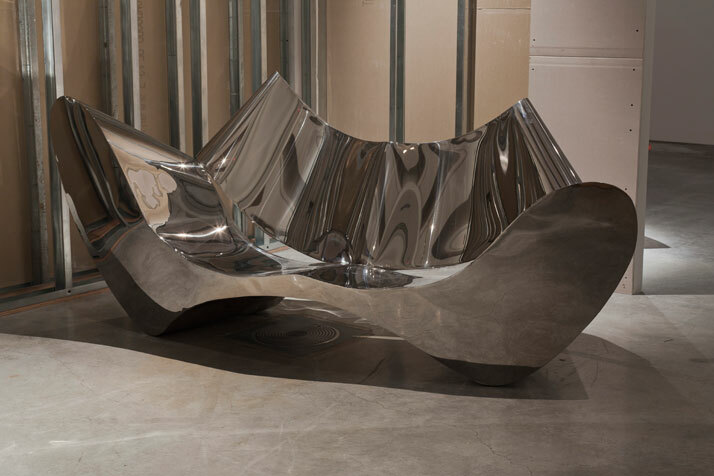 Courtesy of Ron Arad Associates. 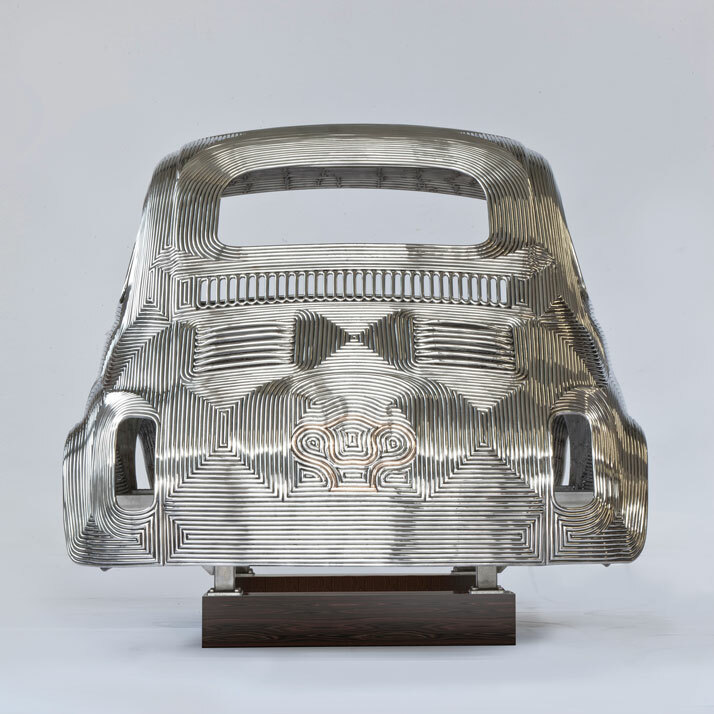 In Reverse, Centro Stile Fiat Wood mould for Fiat 500 (1956). ''In Reverse is an exhibition about the shift from the physical to the digital – except in reverse. Rather than manipulate materials to render them functional or render digital models towards a functional object, here I ‘reverse’ perfectly functional objects and render them useless''. 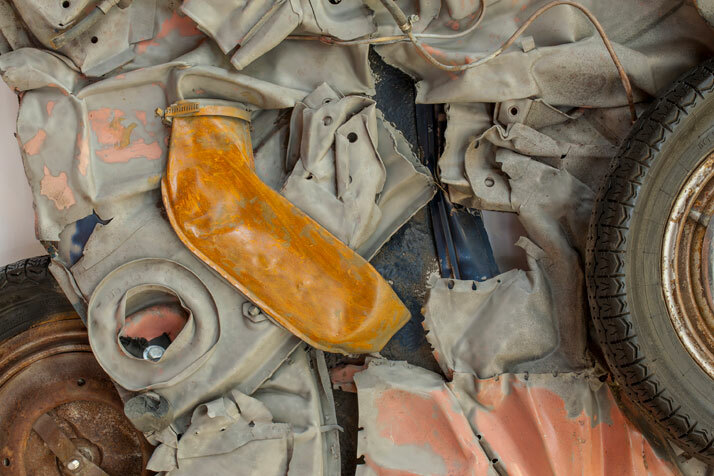 Looking around the walls of the exhibition, one is drawn to these intentionally smashed symbols. And it is this design philosophy that has made us wonder about the aspect of the word ‘useless’ and how easily it can be perceived. 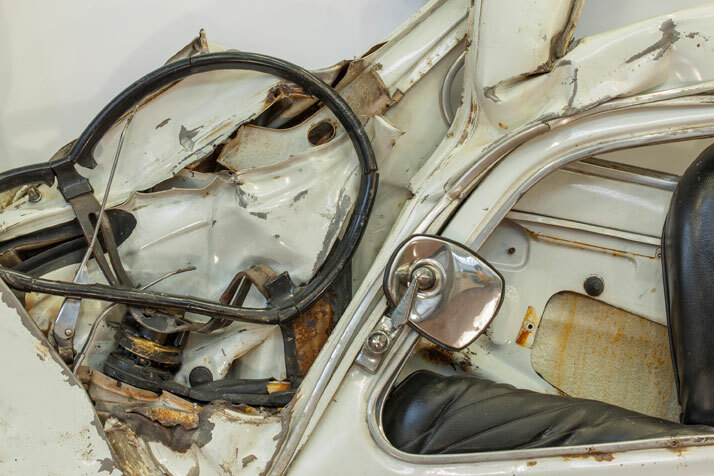 But it also has a deeper meaning - in terms of what materialism symbolizes for us and the sentimental attachment to something that will someday be forgotten, neglected and thrown away. 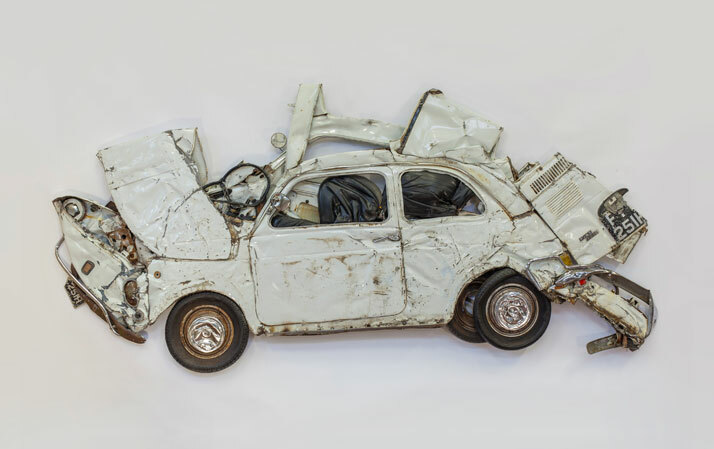 In Reverse, Roddy Giacosa, 2013. 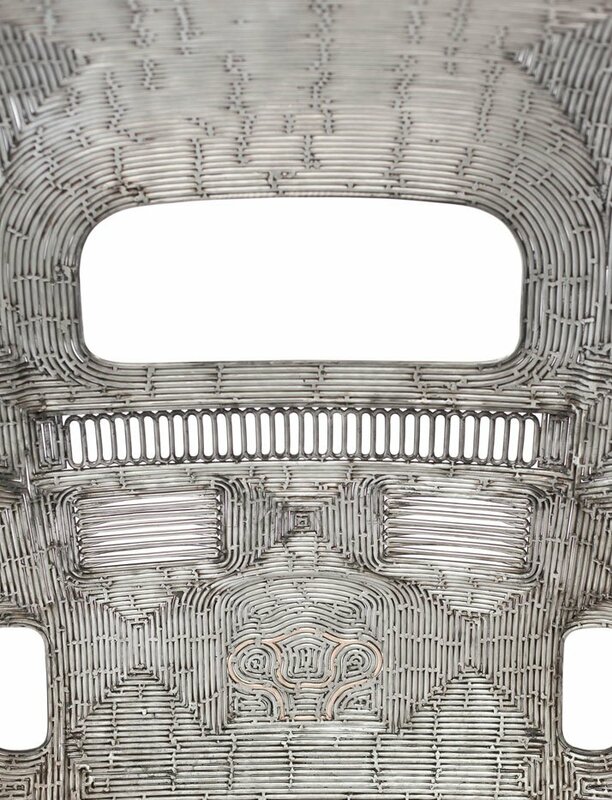 In Reverse, Roddy Giacosa (back detail), 2013. 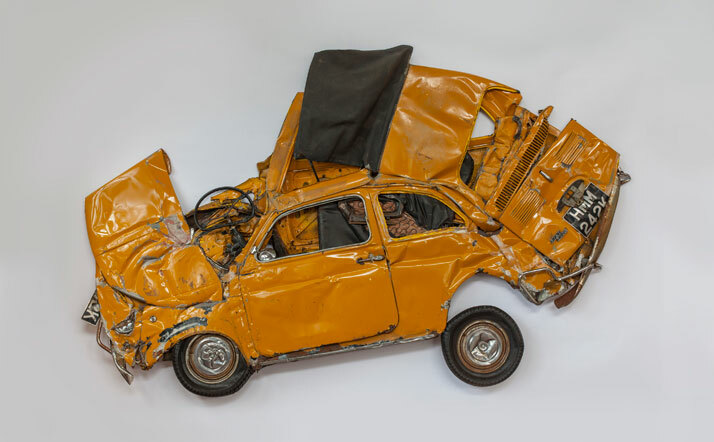 In Reverse, Roddy Giacosa (front), 2013. 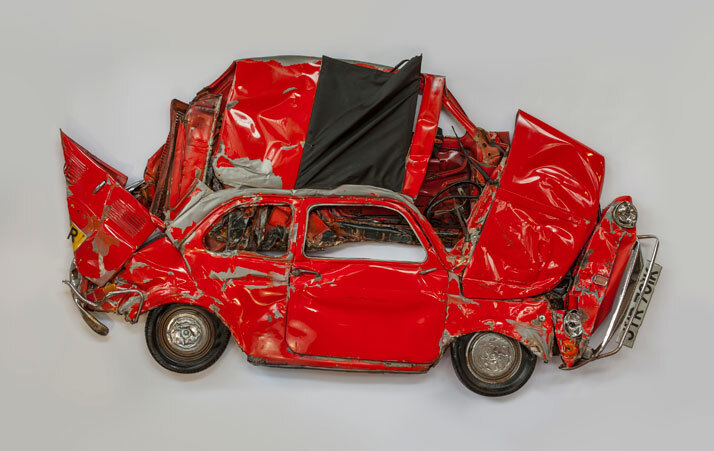 In Reverse, Roddy Giacosa (back), 2013. In Reverse, Let's Drop It, Ok, 2013. In Reverse, Study for Pressed Flowers 2013. 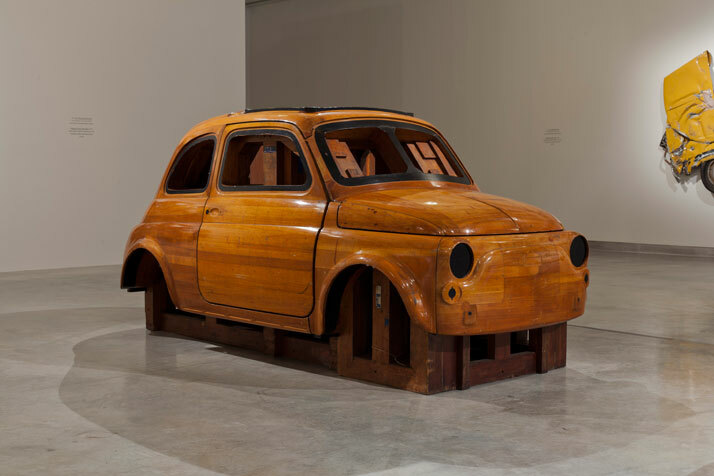 In the center of the space, one comes across a curved wooden forming buck, a mould that was used to shape and fit the metal panels of the Fiat 500, on loan from the Fiat Archive and Museum. This really puts things in perspective. 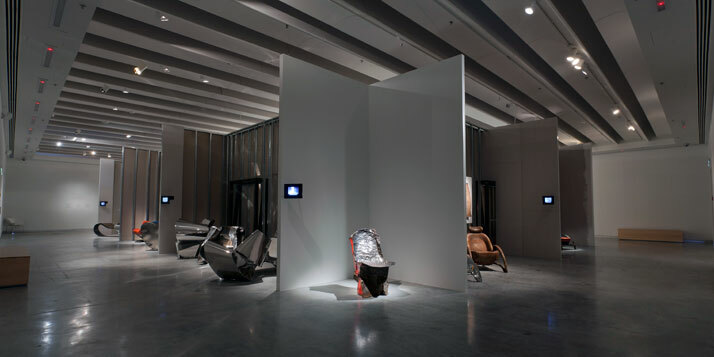 Of course one of the favorites in the exhibition is Ron Arad’s Roddy Giacosa (2013). 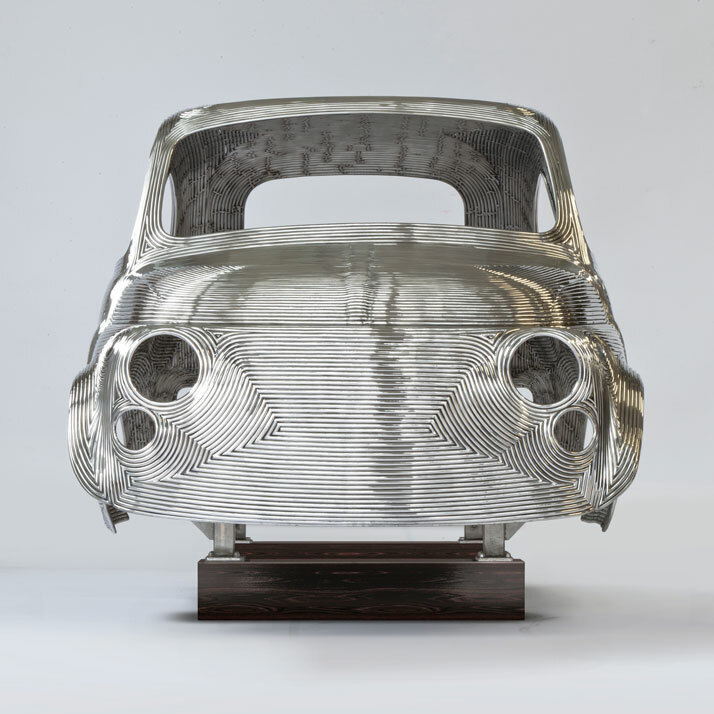 For this piece, the artist has used hundreds of polished stainless steel rods on a metal armature to shape the Fiat 500. The piece is truly magnificent and greatly crafted. Of course, in our eyes the symbolism is great. 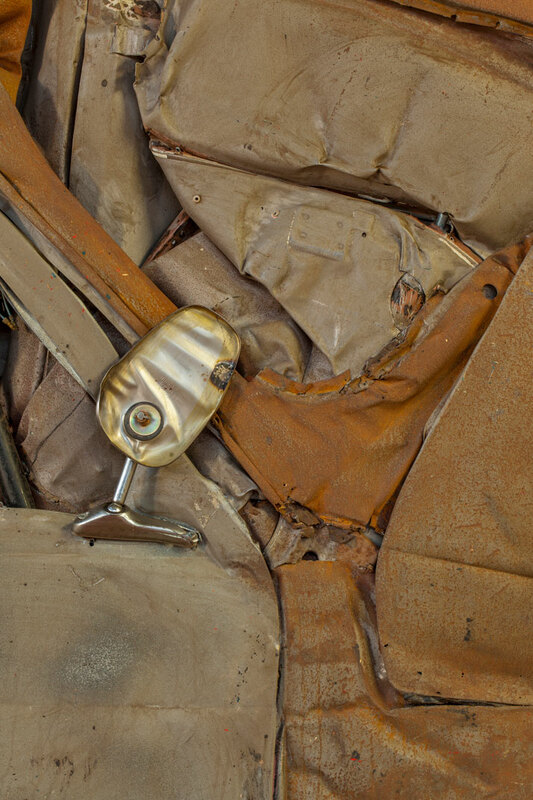 In a single area, you have a new signature car that has been demolished in order to be described as ‘useless’ and a brand new one constructed of raw & old rods. The irony of it all we leave for you to contemplate and decide upon. With dynamic sketches and videos assisting the viewer to understand the process of these creations, the feeling that one experiences going through the artist’s creative process, is magical. 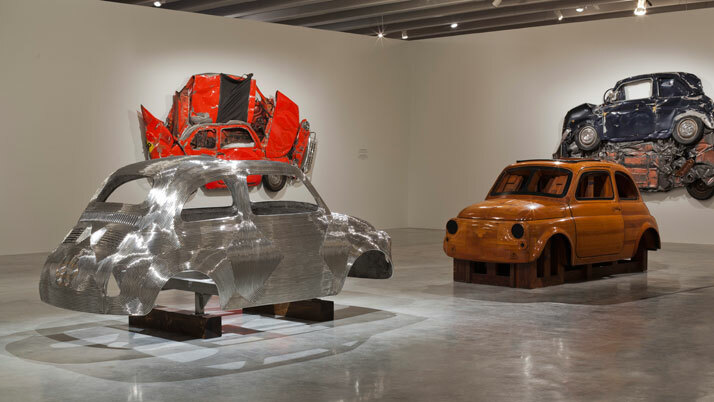 Ron Arad has completed a full circle of creativity as he gives his viewers a great taste of what has been and what is yet to come. In Reverse, Pressed Flower White, 2013. In Reverse, Pressed Flower Red, 2013. In Reverse, Pressed Flower Yellow, 2013. In Reverse, Upper Gallery Overview. 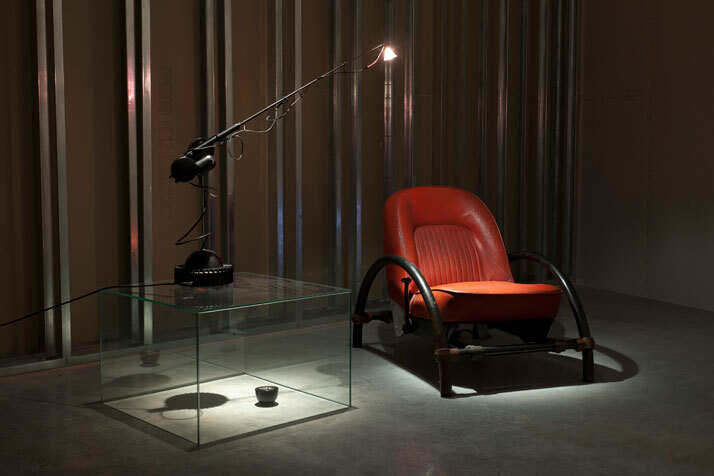 Aerial Light (1981) & The Rover Chair (1981).